At the beginning of the Hundred Years War, English men-at-arms relied on mail for their armor. They had helmets and helms of iron as well, and a few had other pieces of plate armor. By the end of the war, they were covered from head to toe in plate armor. In between, many different arrangements were tried out, earning the fourteenth century a reputation as a transitional period in armor. The best and latest armor was usually not affordable to any other than the very rich, so there were always fighting men who were less well protected. Weapons, and the men who wielded them, had to be ready to deal with a lot of different possibilities. 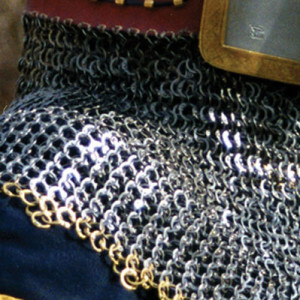 Mail armor was made of interlocked rings of iron, and later steel,most commonly in a “4-in-1 pattern” where a ring had four other rings passing through its center. This produced a mesh of metal that was flexible and very resistant to cuts. The flexibility means it is easy to move in, but it also flexes under the impact of a blow, meaning that sometimes a man could be injured even when the armor itself is not cut or broken. Plate armor, also of iron and later of steel, is resistant to both cuts and thrusts, and spreads the force of any impact over a greater surface. It is not very flexible at all, requiring smaller, connected plates for a joint to move. This articulation of the plates requires skill on the part of an armorer if his client is to be able to both move easily and remain protected. This breakdown into smaller plates has a benefit. It allows the elements, either singly or as an articulated group, to be attached at different points to the wearer’s body. 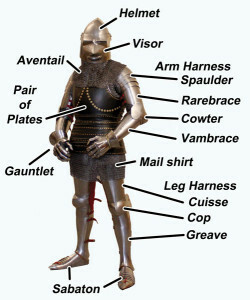 Such an arrangement allows for excellent distribution of the armor’s weight with the net result of improving mobility. 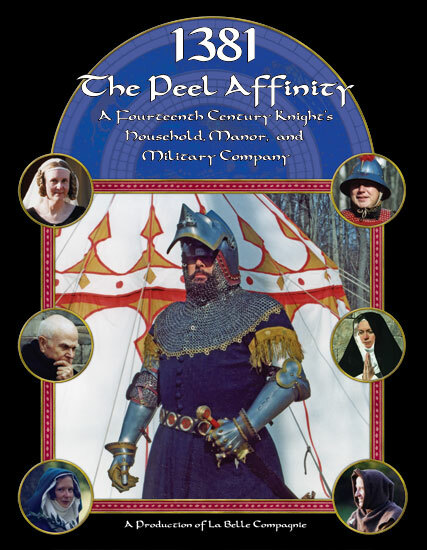 La Belle Compagnie has focused primarily on presenting the late fourteenth and early fifteenth century periods of the Hundred Years War. It should come as no surprise that most of our equipment is designed to be usable for presentations set in those times. To the left is a harness (the medieval word for a set, or suite, of armor) suitable for the late fourteenth century, with its parts labeled. By the last quarter of the the fourteenth century the armor of a man-at-arms was mostly plate. Years of practice and field testing had taught armorers the secrets of articulating joints (joining one plate to the next so they can move easily and not open holes in the defense). Some articulation involves riveting one plate to the next. This is strong but pretty much only allows it to move in one direction. Some parts of the body, such as shoulder and hips, need more than this, so armorers used leather strips to join one plate to another. The leather makes the arrangement more flexible, but is prone to rot and wear, and can conceivably be cut by a blade that slips in between the plates. The armor shown has the limbs almost completely covered in plate and the hips wiht hoops of plate protecting them. The body of this harness is a “pair of plates” in the medieval sense where a “pair” is a “set”; modern students of armor often call such sets “coats of plates.” Each piece of plate is riveted to the the leather outer covering and the whole thing buckles together. Here the buckles are in the back: they are safer, but the wearer needs help to get the plates secured in place. The biggest plate is the chest plate; this is a cost and technological limitation. During the fourteenth century, breakthroughs in iron and steel manufacture started to make large billets of better quality metal available to armorers. Previously they had restricted the available large plate to the head — the most vulnerable part that didn’t move around much. (Necks move, but they mostly make do with mail protection until the fifteenth century.) With larger plates available, armorers were able to make more large, single pieces of armor. As the chest is another very vulnerable part that needs only limited mobility, it was the next place to benefit. Such breastplates afforded their wearers better protection through the curved deflecting surfaces, and fewer places where a blade or arrow might slip through. In the later fourteenth century, one-piece breastplates became nearly ubiquitous, and torso protection is almost the last to go when armor began fading from use centuries later. Eventually availability of such metal increased to the point that armorers could afford to start making single-piece backplates as well. Their developing work was revealed, depicted in art starting around 1400, when some fighting men went to war without a cloth garment covering their body armor, launching what armor scholars call the “white harness period.” But the harness shown, based on a statue dated to c.1380, has many small plates. This armor uses a mail shirt beneath the pair of plates that covers gaps in the armpit, elbows, and between the shirt and the leg plates.